Whatever your business, Office, Factory, Convenience Store, Sports Complex, and many others, Watson Company makes it easy to provide Coffee and specialty drinks to your employees or customers. Watson Company provides the equipment, cleans the equipment, and maintains the equipment. You simply order the desired product from Watson, online or thru your personal Sales Representative, and it is delivered to your location. Coffee - With the demand for specialty drinks rising (cappuccino, lattes etc.) Watson and Mother Parkers have teamed up to offer a variety of products, and flavors to meet these new tastes. Mother Parkers wide selection of exciting and flavorful coffee blends offer that �just roasted� freshness. Mother Parkers offers the most comprehensive line of roast and ground, wholebean and instant coffee products in a variety of package options. Tea - Since 1912, Mother Parker has been an integral part of the tea experience, blending the best of traditional and innovation to produce a superior selection of quality teas and herbal infusions to meet the tastes of the times. Specialty - Mother�s Parkers� delicious line-up of specialty instant beverages including cappuccinos, lattes and steamers deliver authentic caf� flavors in an instant. This quick and convenient indulgence has been specially developed to satisfy the most discriminating of tastes - served hot or cold! Flavors include Parisian Vanilla, Swiss Mocha, English Toffee and the original Captivating Cappuccino. Equipment - Watson Company tailors the equipment to meet your individual needs. All equipment is commercial grade for reliability and taste. 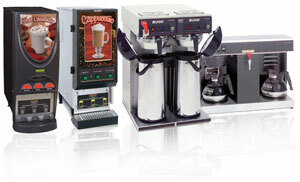 From Low Profile Automatic, to Twin Airpot with LCD, to Cappuccino and Hot Chocolate, all equipment is provided Free of Charge with product purchases.